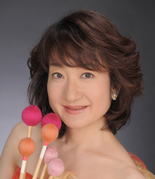 EMIKO KITAZAWA first found marimba at the age of seven and was immediately fascinated with the instrument. She learned the technique rigorously and soon began to appear regularly on "Let's Sing and Listen," a nationwide public TV program in Japan. COPYRIGHT(C) 2010 KITAZAWA. ALL RIGHTS RESERVED.